← Does web “banner blindness” correlate with in-store screen viewership? Samsung just unveiled an amazing new solar-powered LCD television that can operate completely free from the power grid! The 46″ prototype TV, shown at CeBit in Germany, includes solar panels that produce energy from the ambient light in a room – because it was engineered to use very little energy, no additional power sources are needed. 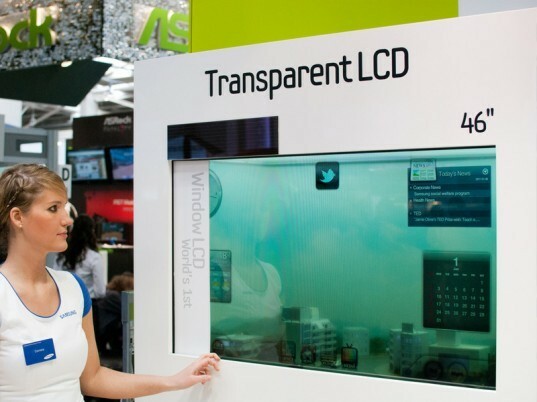 Another major breakthrough behind the concept is that the thin screen can display images and information while allowing objects behind it to be visible – this means that it has applications ranging from car windshield HUDs to storefront displays and digital window blinds. Samsung also unveiled a laptop prototype with a translucent AMOLED screen earlier this year, so it is interesting to see that they are developing a see-through LCD at the same time. The size restraints, color consistency, lifespan, and limited light output of AMOLED (Active-matrix organic light-emitting diode) displays may point to why Samsung is leveraging two technologies with similar uses.